Afraid To Advertise? Some People Are. However, The Time And Effort It Takes To Advertise Is Worth It. (San Diego, California, USA): In the late 1990s, I was selling industrial equipment and would read the trade magazines in our office. I noticed that our company in San Diego was not advertising. I worked for two (2) yellow page companies in the early 2000s. Our managers were very good at their job and really knew the ins and outs of yellow page advertising and how customers reacted to advertising. When I was a very new sales representative, my manager Patricia told me there are those business owners who don't need to advertise but they do and there are business owners who need to advertise but they don't. I later found out in the field, that her statement was completely true. Helicopter Links Client Fear Example: Fast forward to selling advertising on Helicopter Links website. I had a client who originally found Helicopter Links in 2014 and contacted us because their company sold products to the helicopter industry and they knew that we'd be a good place to advertise their products. I got them a good rate and they kept renewing their advertising with us until 2017. This particular client was very happy advertising with us. In 2017, there was a personnel change and the person in charge of purchasing advertising changed to a Vice President. I emailed this person all the information about the List Price, their discounted pricing, the many years they had advertised with Helicopter Links and why advertising on a directory is important. (Your company is advertising to buyers in the buying process). I also called him on the phone and discussed everything with this Vice President. However, he claimed that he couldn't approve the spending of a little over $1,000.00 USD for their company. He said he had to get an approval from his boss. Now maybe I don't understand the ins and outs of corporate America but why would anyone accept the title of Vice President if you can't approve of spending a little bit of your company's money? Wow. To me, this is bizarre. However, I think I know the real reason why he didn't approve of the advertising. It was due to fear. He's probably never purchased advertising before in his life. He also probably doesn't know a good value in advertising pricing even though it's right in front of him. And who knows, maybe he cancelled the advertising to spite the person who had purchased it in the first place. Who knows? I know that he didn't have any rational and thought-out reason to renew his advertising but I bet he did not renew the advertising due to fear. Helicopter Links Potential Client Fear Example: In the helicopter industry (naming no names! ), I found out from an advertising agency (a former employee of the agency) that a large and famous manufacturer in the industry didn't advertise with Helicopter Links because the employees were afraid to make a mistake and possibly look bad in front of their peers. What Are The Common Reasons For Not Advertising? Of course, I feel the most common reason why small business owners to medium sized companies won't advertise is the fear they might get ripped off. Who wants to be sold? And who wants to be sold a bad bill of goods? Who wants to make a mistake? So I'm guessing that "it's better to not even try," type of attitude, is also something that stops people from advertising. When you buy a new set of rotor blades, paint, Avgas, an engine overhaul, food or clothing, etc., you can see the product and the product is useful. However, with advertising, you don't receive a physical product that you can use on a daily basis. Advertising is an idea. I think the combination of not being sure if the price is worth it and since it's the buying of an idea, is the one-two punch that scares people away from advertising. How does a boss or marketing professional overcome their fear of looking at their advertising options? Education. I think the answers are not that difficult but do require some thought. 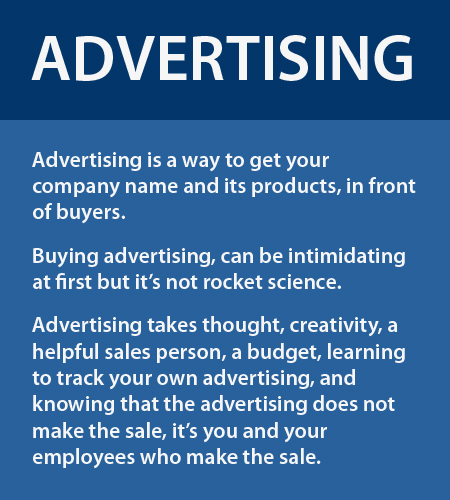 For examples, one must ask oneself, "What are the types of advertising are there? And where should I advertise". To answer the first questions. There are two types of advertising: Creative and Directional (or Directory). Creative Advertising. Creative Advertising includes magazines, newspapers, radio, TV, billboards, websites, social media, trade shows, trade show give-aways, business flyers, business cards and anything else which is not directional advertising. Creative Advertising is where the seller is searching for a buyer and is a good way to brand your company and products. Here's an example where the seller is searching for buyers. In a magazine, the user's main purpose is to read the articles, not read the advertisements. That's why they quote readership statistics. The buyer wants to read the articles but might very well might not be interested in buying any particular product that is being advertised at that moment. The advertising is an interruption to the user. And Creative Advertising is generally, regional in nature and very expensive. Directional (or Directory) Advertising. Directional Advertising is any type of directory, from the printed yellow pages, to an online yellow pages (like Helicopter Links website) or Google. Google is probably the most used and well know online yellow pages today but the user (probably) never thinks that Google is an online yellow pages! A directory is where the buyer is searching for the seller. Directory Advertising is an excellent way to advertise, market and brand your company and it's products to buyers in the buying process. 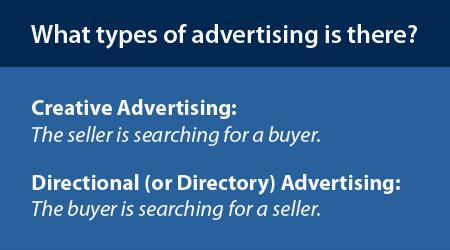 With Directory Advertising the buyer wants to look at the advertisements and wants to be sold. Directory Advertising is generally affordable. Now that you know there is both Creative and Directional (or Directory) Advertising, I'd always advise businesses to have advertise with both types of advertising. If you are using only Creative Advertising, you are missing out to advertising to buyers in the buying process, ready to buy. Likewise, I would never only use Directory Advertising. You would be missing out on having business cards, flyers, mailings, websites, social media and even missing out on a trade show booth (that is, if the expense of attending a trade show can be made with new sales). Then keep in mind of where you want to advertise? Locally, between multiple states/provinces, nationally and/or internationally. In addition, it's important to know where you typically gain new customers, using good sales techniques and customer service, knowing what products you want to sell, understanding that your products and services are priced correctly, advertising tracking techniques, do you have an email list and mailing list and are you using social media? When your budget allows, having a mix of both Creative and Directory Advertising will help you know that your advertising priorities are in order. Now for a change of pace. Graphic Design, Web Design, Photography, Professional Writer. When advertising, it also helps if you understand a little about graphic designer (either full-time or part-time),web designer, photographer and hiring a writer and having a web designer. All these people are needed to work together to make an effective marketing team. While hiring all these types of employees for a small might not be possible, there could be a possibility of hiring these people on a part-time basis. To expect one person to handle all these jobs is not realistic and in my opinion would be unfair for the employee. But these are the things needed for a good marketing communications department. Medium to large companies should have all these types of employees, if not, the company is not using the full resources of today's marketing advantages. A graphic designer designs all things which are printed for the company such as business cards, flyers, posters, trade show banners, all office signs, advertisements for magazines and banner ads for websites. 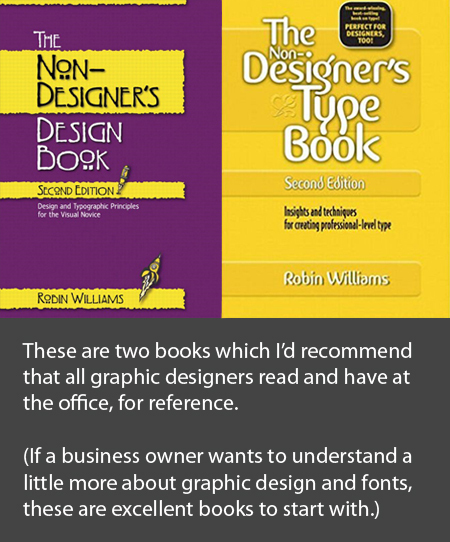 I would recommend for every business to have in their library the books, "The Non-Designer's Design Book" and "The Non-Designer's Font Book" both written by Robin Williams. These two books are a great start to good graphic design for the professional and amateur. A web designer can create a new website, make additions to and revisions of your current website. Today, websites are preferred to be made so that they resize themselves depending upon the device the user is holding. A website can be designed so it looks good on a mobile phone, tablet or desktop. A web designer works in conjunction with a graphic designer, photographer and a writer. The web designer is not expected to be a professional writer. A professional photographer should be in charge of taking pictures such as product pictures, office and plant pictures, employee photos, event photos, trade show photos and all other photographic needs. A good photographer will take pictures from the left, center and right side of all products so that the graphic designer has the right angle of a photo for any advertisements they are creating and so the web designer has a choice of which angles to have the photo on the website. A good advertisement has the product or person facing the text of the ad. 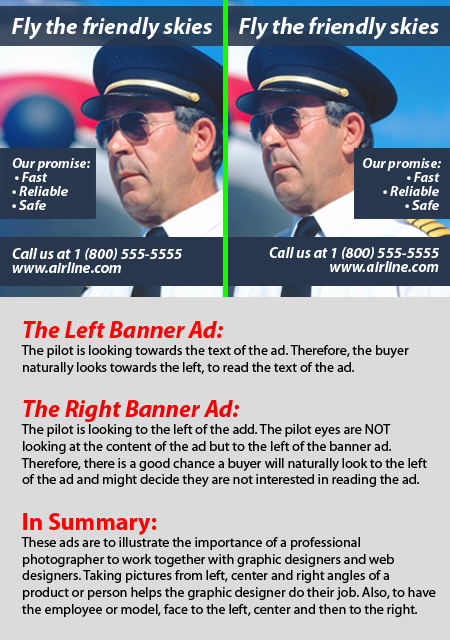 If a person in an advertisement is on the right side of the advertisement and is looking to their left (or as one would view the advertisement, the person is looking towards the right, then the reader eyes naturally go away from the advertisement. This is why it's important to have a knowledgeable photographer who takes all pictures from many angles to make sure the graphic designer and web designer have options when using these photos. A professional writer or technical writer has a daunting task. The responsibility of the writer is to author their entire website and make all revisions to the site. Ensure all flyers and advertisements have correct spelling, wording and grammar. In addition, the professional writer should be consulted for all social media posts. And the writer(s) can also help the sales people and managers to make well-written emails and letters to clients. Another book I'd recommend that all business people read, including the writers, is called, "The Mac is not a Typewriter" by Robin Williams. This book is relevant now as when it was first written in 1990. Then one can grow your library over time with books such as "The Associated Press Stylebook" by the Associated Press and other books on writing, graphic design, logo design, web design, web statistics and more. One word of advice when it comes to logos. Logos are fine to have but when you are a small company, I would never try to brand your logo without using your full company name in the logo. Small to medium sized businesses don't have the millions of advertising dollars that the huge corporations have to brand something like the Nike swoosh. It's not worth your time an effort to refuse to your company name in your logo because you want to people to remember the name of your company, not the logo. Little tricks of the trade help your marketing department produce effective and easy to understand graphics so your customers know what you are offering to them. A knowledgeable advertising sales person will ask what type of products and services you want to advertise and can usually come up with an effective advertising plan and to fit a business owner's budget. A good sales person will visit the potential client's website to get an idea of what type of business their understand something about their products and services. Then the business owner can discuss their top sales goals, his advertising budget, tracking, etc. and a good advertising sales person can help them get the right advertising, in the right place. To get a better handle on the effectiveness of advertising, a business has to track their advertising. Did you ever wonder why there are coded numbers on coupons? Or an advertisement might say, tell us this code on our ad to get a discount? This is how companies track the effectiveness of their advertising. There are several things that the business owner and the marketing people might not realize. Advertising sales people want their clients to be successful and for the client to get business from their advertising. When advertising sales people discussing advertising, we are really trying to help you have the best advertising program for your company. At Helicopter Links we offer several services, at no additional charge, to help your ads to be successful. We make your banner ads at no charge. We will also recommend what words and pictures to use in your banner ads. When people call us looking for products and services in the helicopter industry, we always recommend our clients first, to these callers. Your ads can be revised or changed at any time throughout the year and without any charge. We are available year-round to discuss marketing, advertising, branding, tracking of advertising, graphic design and web design, with anyone in your office by phone. With Helicopter Links, our advertising contracts are for 1 full year (a full 12 months). You receive as many clicks on your ads that you get in a year, for one set price. Advertising can be renewed each year. We offer these things above because we want to make advertising as easy as possible for your company and we want you to be successful. And please remember that advertise is how you get your company in front of buyers searching for sellers. Advertising helps you marketing and brand your company as well as gain new clients. We hope that if you advertise with Helicopter Links, you'll enjoy advertising with us, and hope we help you gain more customers so that you want to renew your ads each year.